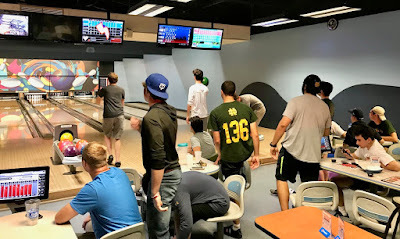 The Gentlemen's Monthly: Bowling Monday. What better way to end a Monday than with some bowling. Bowlers of all skill levels took to the local lanes of Strikes and Spares and enjoyed some friendly, but quietly competitive, bowling. Yes, some bowlers gave it the old college go while others brought their own bowling bag complete with three sets of balls. Some saw their score improve steadily while others, like AR Frank Spesia, plateaued in mediocrity. Some had graceful swings, and others had, well, anything but that. Someone who really hit his stride tonight was freshman Luke Distefano. Managing to get his swing under control, Distefano tore up lane seventeen with a steady streak of spares and strikes, including two strikes in row in the tenth frame... all at the prompting of his fellow bowler Axel Raarup! After throwing two strikes in the 10th, Distefano went for a third, but did he make it? Watch the video below! On his success the bowling wunderkind Distefano said, "It's all about getting a light ball and throwing it with power."